OK, OK, you've been wheedling me for the recipe. So I'm sharing it in my own words. But I need you to be clear it comes, unadulterated, from Harry Eastwood's superb book Red Velvet and Chocolate Heartache. So try it. Love it. And then go straight out and buy the book! She has put a LOT of work into developing it. These are gluten free. And butter and dairy free too if you change the butter icing for a water icing (icing sugar made into a paste with the orange juice). Preheat oven to 180C. Fill a 12 hole muffin tin with paper cases. Using an electric whisk, beat the eggs and sugar together for 5 mins until light, creamy and quadrupled in size. Peel the butternut squash, this uses about one third of an average size one. Remove the stringy bits and the seeds. Then start grating. By hand. Do not use a food processor. Use the finest holes on your normal box grater or Cuisipro grater. This will take some time! Do not do it in advance or it will dry out, and you need the moisture. Add to the egg mix, along with the other ingredients. Using a spatula stir until fully incorporated. Spoon into the paper cases and cook for 20 mins. They are ready when risen and golden. Check after 15 mins. Leave to cool fully before icing. At least 30 mins in a cool place. 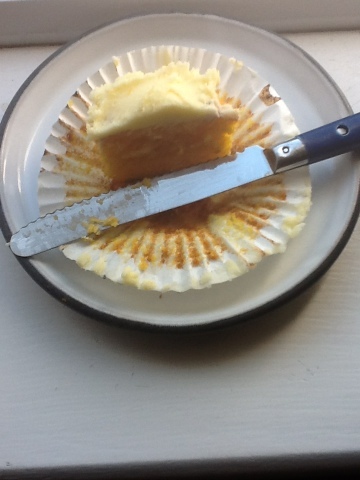 Make the icing by whisking the butter and sugar with an electric whisk. Add all the zest, and as much juice as you can, without making it too runny. Ice and enjoy! Instead of the flour could you use all almonds? Hi Eilis, You could try, but in the introduction she explains that she found that the combination of ground almonds and rice flour gave a light textured, nice crumb to a cake, and she uses the combination of them in pretty much all her cakes.